This recipe for roasted chicken and vegetables is such an easy healthy dinner! If you’re looking for a recipe that is not only healthy for your whole family but easy to make too – this is the PERFECT recipe! I return to this recipe again and again on nights when I’m wanting something healthy but not really looking to slave in my kitchen all evening 😉 It’s a great recipe and it’s so moist, flavorful, and delicious! It’s the perfect easy chicken recipe. The only thing better than an oven roasted chicken recipe is an EASY chicken recipe! 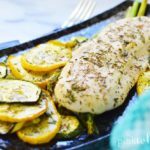 This sheet pan chicken makes THE BEST easy healthy dinner for the entire family! You’ll be running back to this recipe and its moist, flavorful, delicious taste more than you think. 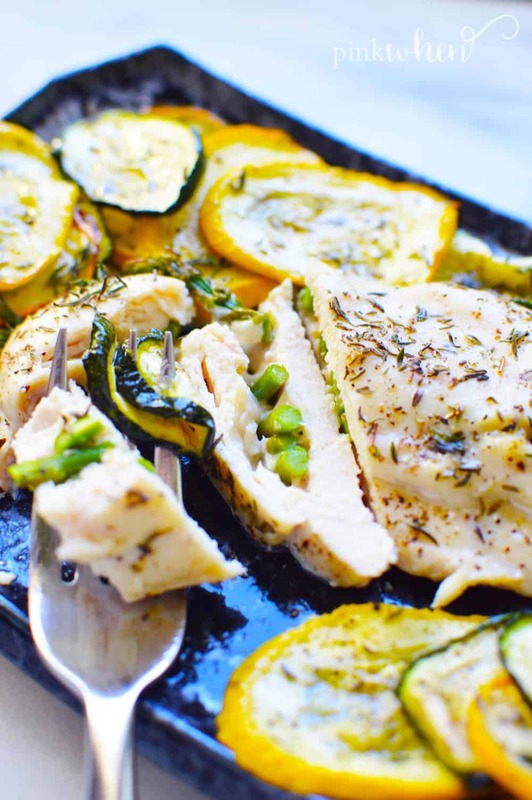 I mean … an easy chicken recipe isn’t hard to find but one that’s an easy healthy dinner too? YES PLEASE. 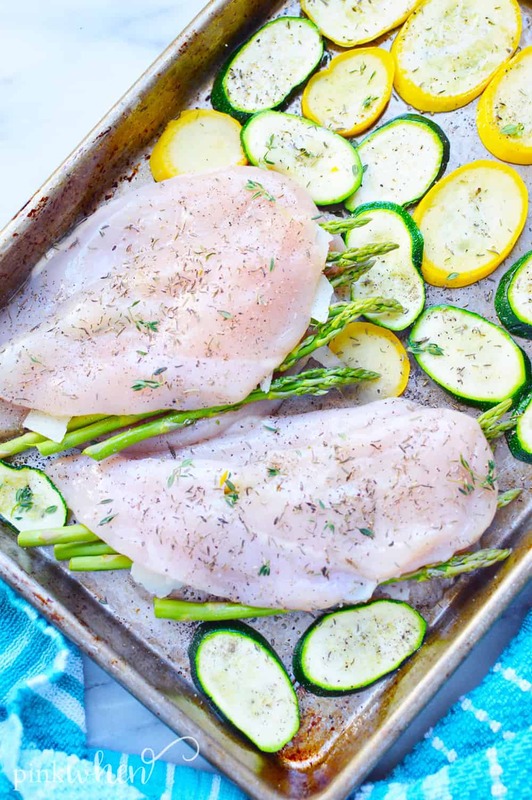 This sheet pan chicken and veggies recipe is as easy as slicing up some veggies, seasoning your chicken, and throwing it on a sheet pan to cook! Just scroll down below to check out the full oven roasted chicken recipe. 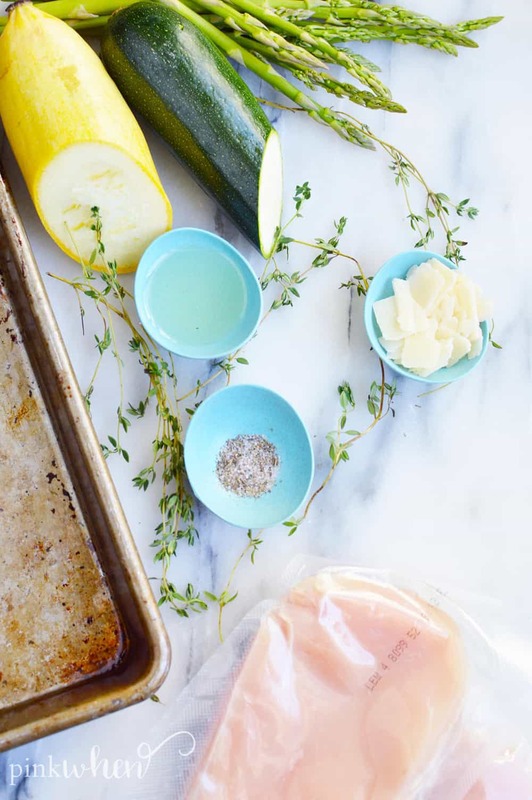 With this sheet pan chicken, you’ll want to be mindful of the size and thickness of your chicken. 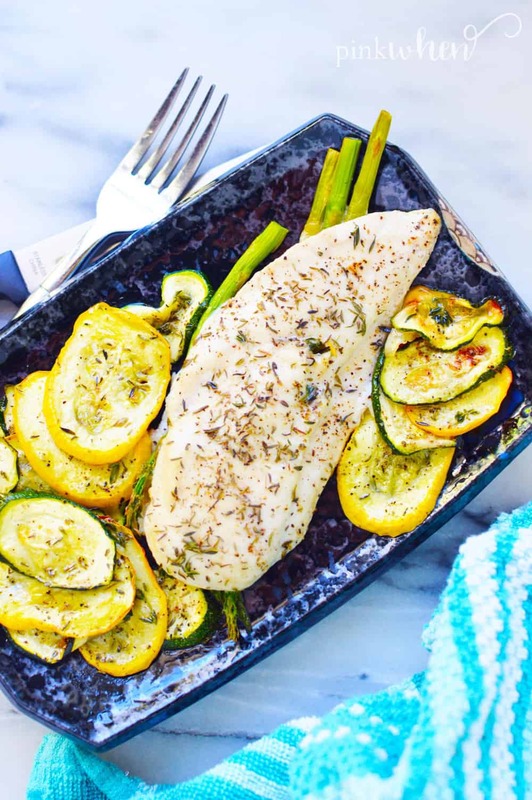 I used thin cut chicken breasts so they cooked quickly – but be sure to adjust your own cooking times depending on the chicken you’re working with. If you have thick cut chicken, you may want to cook this for longer. You can use a meat thermometer to make sure your chicken is cooked thoroughly. Here are those 3 steps to ensure you have the best sheep pan chicken, and that it isn’t dry. Brining the chicken will ensure to help keep the flavor and moisture. Step 2: Cook the chicken at the proper temperature. Make sure you bake at 375 and coat the chicken with an olive oil based cooking spray before seasoning. This also helps to keep the chicken moist. Step 3: Time the chicken perfectly. Depending on the thickness and cut of chicken, you may need to adjust your time accordingly. At 375, you should bake the chicken for 20-25 minutes, or until an internal temperature is 165 F.
Anything less will not be fully cooked, and anything more could be overdone and dry the chicken. I know you’re just dying to get to the oven roasted chicken recipe so I won’t keep you waiting any longer – promise. I know you’re going to love this easy healthy dinner for your family too! 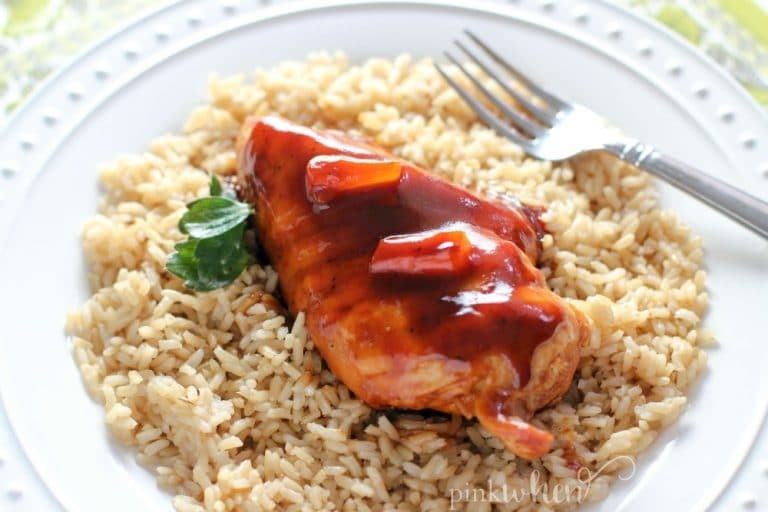 Leave a comment below and let me know how you enjoy this moist, flavorful, delicious easy chicken recipe! We love your feedback, as it helps us decide what to create next. If you want to see more recipes like this, make sure to RATE this recipe! A quick, easy, and delicious meal in less than 30 minutes. Preheat your oven to 375F. Coat a small baking sheet with half the oil, reserve the rest for later. Cut the asparagus to be approximately the same length as your chicken breasts. 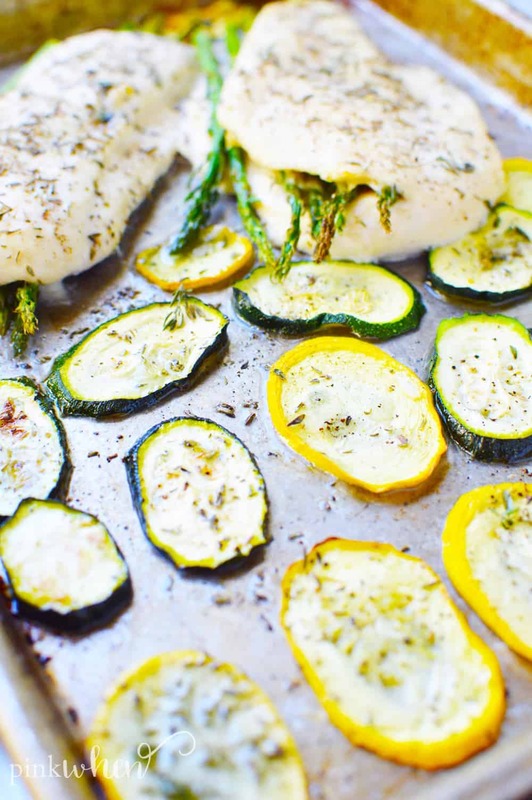 Wash and thinly slice your squash and zucchini. (optional) Lay out your squash and zucchini on a plate and season it to your liking. Microwave for 1 minute - this helps ensure it will be baked to your liking. Carefully butterfly cut your chicken and sprinkle some of the cheese over the top. Lay the asparagus on top, followed by another layer of cheese sprinkled on top. 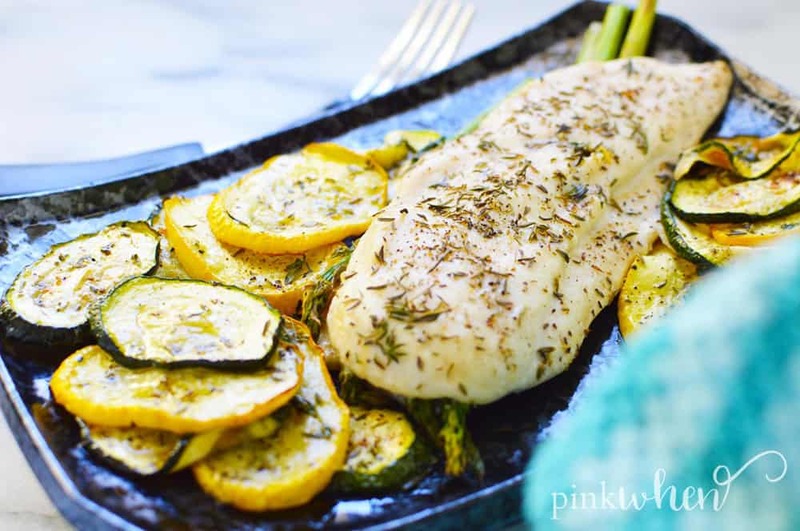 Place the squash and zucchini on the same tray as your chicken along with any additional seasonings (we used thyme, salt, and pepper) you would prefer. Cook for approximately 10 minutes, adjusting the cooking time as needed depending on the thickness of your chicken. Use a digital meat thermometer to insure chicken has cooked thoroughly. Plate and enjoy! If you loved these sheet pan chicken and veggies, you’ll love this Instant Pot Hawaiian Chicken recipe! 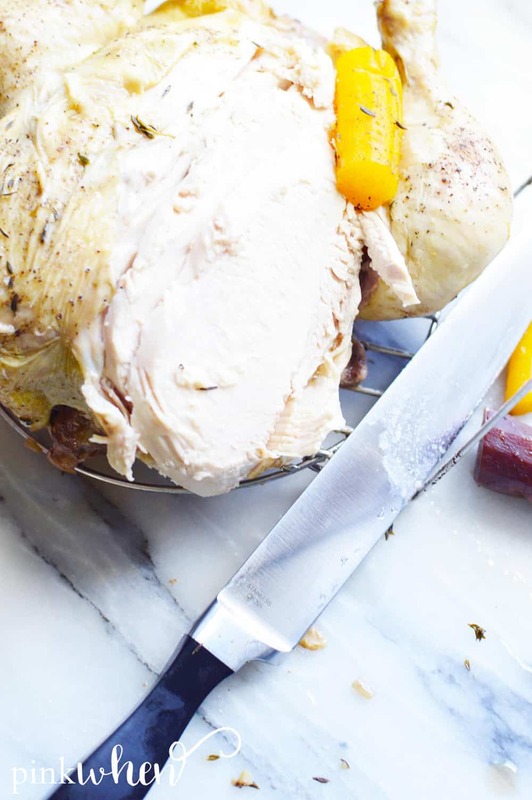 Or this delicious Instant Pot Classic Whole Chicken Recipe!